The closest airport is Logan Airport in Boston, which is about eight miles from campus. From the terminal, follow the signs to Ground Transportation, where you can take a taxi to campus or take a shuttle to the MBTA (see below). The fare to Boston University’s Charles River Campus from Logan Airport should be around $45. You can get an authorized taxi from a taxi stand outside each terminal. There is usually a short line and a dispatcher will place you in the next available taxi. When traffic is light, the taxi ride will take about 20 minutes. During peak hours, the ride could take 45 minutes or more. It is customary for the passenger to add a gratuity of 10-15% of the fare. Around town you can hail taxi cabs on the street or find taxi stands in front of many hotels. Boston has a comprehensive public transportation system known as the MBTA or the “T,” with bus lines, trolleys, and subway trains running throughout the city. Our best advice is to purchase a Charlie Card. Charlie Cards are free and may be obtained at ticket windows, for example at South Station and Kenmore Station, until 7 pm, seven days a week. There are also Charlie Tickets, available by machines, but passengers pay a small surcharge. Charlie Cards and Charlie Tickets may have money added to their balance as needed. 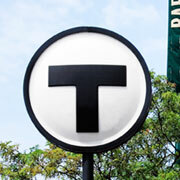 You can use the MBTA’s Trip Planner or Google Maps transit directions to find your way. The MBTA has up-to-date advice posted for travelers from Logan Airport. Although travel via Blue Line to Government Center looks like a good route on some maps, Government Center Station is currently closed. Upon arrival, your best option via the T is to take the Silver Line (really a bus). Inbound (only) from Logan Airport this includes a free transfer to the MBTA system. Take a Silver Line bus from the curbside outside your terminal to South Station. At South Station, exit onto a platform and follow the platform until you find signs to the Red Line, inbound to Alewife. Change to the Green Line at Park Street Station. On the Green Line take an outbound Boston College B train to BU Central for the George Sherman Union or St. Paul St. for the Student Village. Alternatively, you may take any B, C, or D train to exit at Kenmore Station. Another option for travel from the airport is to take Back Bay Logan Express ($5, run by Massport) to either Copley or Hynes Auditorium stations, from which you may continue on the MBTA Green Line. If you are arriving by car, we assume you can find directions using online mapping programs or your smartphone’s GPS. The address of the Student Village Housing is 10 Buick Street, Boston, Massachusetts 02215. There is no provision for overnight parking at the Student Village. Boston University has a single overnight lot for visitors, at 808 Commonwealth Avenue Lot ( Lot F ). This open air lot is located directly next to the Fuller Building and is near the BU Bridge. The rate of this lot is $24/day and the parking must be purchased from the lot attendant. The lot is attended weekdays from 7AM to 9PM and please keep in mind that the only method of payment accepted at this lot is cash. The ticket issued by the lot attendant should be displayed on the dashboard of the vehicle at all times when the vehicle is parked in the lot. On weekends, you may park at metered spaces on Commonwealth Ave. or other city streets (meters are free on Sunday). An alternative for long-term overnight parking is to use MBTA parking. The most convenient lot is probably Riverside, which is at the end of MBTA the Green Line, a ride of about 30 minutes. The cost is $13 for the first day plus $7 per day thereafter.